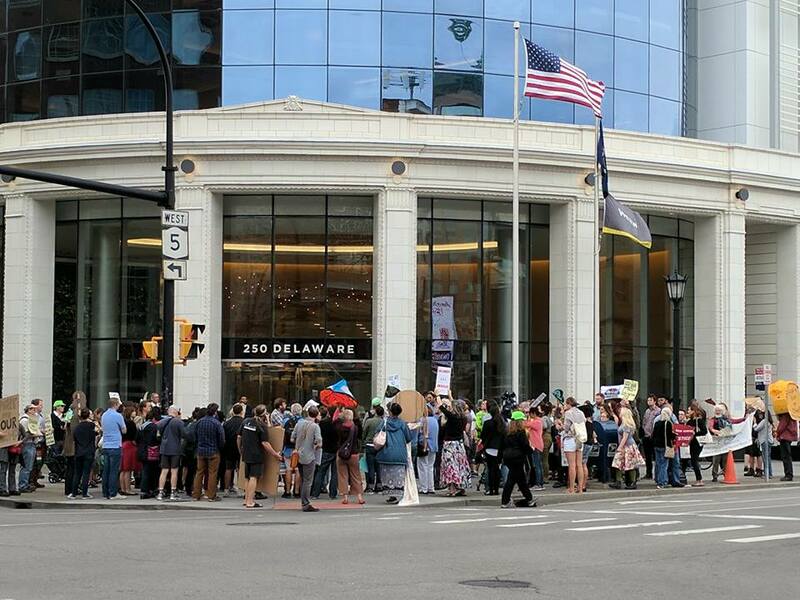 This week in Buffalo, more than 100 people marched to the corporate headquarters of concessions giant Delaware North to protest the company and its owners’ backing of Donald Trump and his anti-immigrant policies. The 7th floor of the Delaware North Building serves as the Western New York offices for ICE, Immigration and Customs Enforcement. Delaware North, owned by billionaire Jeremy Jacobs and his family, is a multinational operation that controls stadium concessions, restaurants, hotels, and national park amenities. The Jacobs family has channeled the firm’s revenues into political donations – including more than $167,000 to President Donald Trump – securing millions of dollars in tax breaks from the communities where it operates. Beyond the protests in Buffalo, Delaware North is facing agitation in Detroit where it plans to open a restaurant in partnership with avid Trump supporter Kid Rock in the publicly-subsidized Little Caesars Arena. The Jacobs family’s ability to channel millions of dollars worth of tax subsidies and public contracts to their businesses and the use of their billions of dollars in net worth to prop up Donald Trump make Delaware North a prime target for activists opposing Trump’s attacks on immigrants and people of color. PAI senior research analyst Robert Galbraith published an article in The Public, Buffalo’s alternative weekly newspaper, detailing the Jacobs family’s support for the Trump administration and highlighting their connections to the University at Buffalo, where 17% of the student body comes from other countries. Trump’s termination of the Deferred Action for Childhood Arrivals (DACA) program will affect UB students. 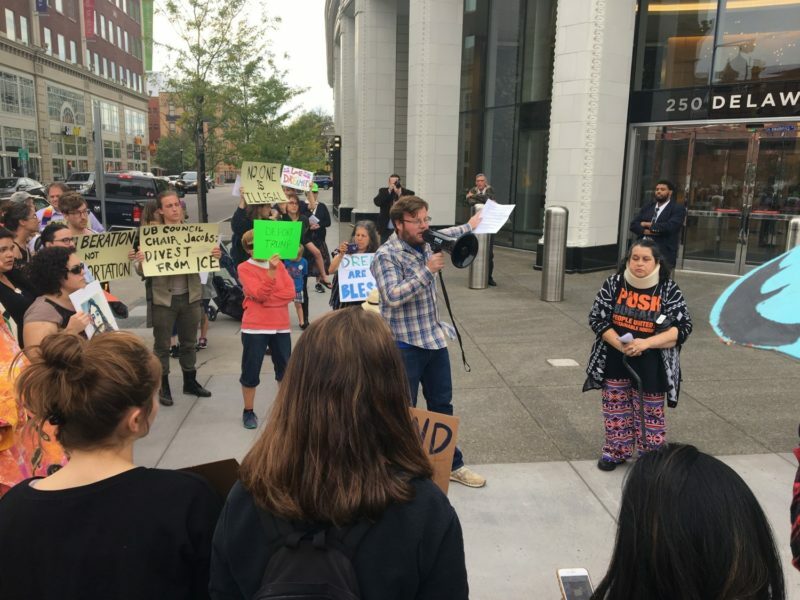 Indeed, it’s not inconceivable that UB’s DACA students could end up being processed for deportation in the ICE office in the corporate headquarters of the chairman of UB’s governing body and trustee emeritus at its foundation. Organizations including Justice for Migrant Families WNY, UB Sanctuary Movement, Buffalo DSA, and New York Immigration Coalition organized a rally and march in downtown Buffalo to draw attention to these ties. In addition, please be aware that Delaware North is not the owner of The Delaware North Building and does not determine the leasing of other space in the building. Also, it should be noted that Delaware North is a global company with a variety of businesses involving various levels of government and is therefore active in the political process with both major U.S. political parties. While the Delaware North Building in Buffalo is officially owned by a subsidiary of a local real estate developer – Uniland Development – the entity that owns the building is structured as a partnership with no transparency over who the partners are. When Uniland applied for tax breaks for the building, it did so as DNC 250, Inc., a corporation named after Delaware North Companies and the address of the building. Further, Delaware North controls more than 70% of the space in the building with its various businesses, including its corporate headquarters, a luxury Westin hotel, and two restaurants. Simply put, Delaware North has tremendous leverage over who occupies the building even if they aren’t the owner. White’s suggestion that Delaware North could not use their heft to influence their landlord is disingenuous at best. White is correct, however, that Delaware North is a mammoth conglomerate with venues stretching across the country. The corporation’s size alone gives them enormous power and influence, which they have used to extract subsidies from communities around the country. Buffalo saw Delaware North exercise that power in 2014 when the company threatened to leave the city if they were not given public money for a new corporate headquarters, despite receiving millions in subsidies in previous agreements with the city for its original headquarters. The threat rattled many local politicians including Buffalo’s mayor, who leapt at the chance to sing the company’s praises. “Delaware North, which will soon celebrate its 100th anniversary, did not want to move, but they were coveted by other places around the country because of their reputation of success,” said Mayor Byron W. Brown. “By retaining Delaware North, we will increase Buffalo’s reputation as a place to expand international companies,” the Mayor added. In the end the threat worked, the company got its way, and $807,000 in taxpayer money was doled out to Delaware North to build out its office at 250 Delaware Ave. Byron Brown has since received $11,750 from Jacobs family members and businesses for his 2017 re-election campaign. Delaware North’s reach and influence stretches well beyond its downtown Buffalo headquarters that house ICE. Indeed, the Jacobs family business is a veritable global empire. Delaware North operates at least 113 venues across the continental US. Most of these are restaurants, concessions, and retail stores located at sports stadiums, airports, and major tourist attractions. The states that have the biggest concentrations of Delaware North operations include New York (25), California (20), Floridia (7), Arizona (5), and Ohio (5). The conglomerate has a presence in and around numerous major cities, many of which have seen protests against ICE and Trump’s anti-immigrant policies. Some of these cities include Atlanta, Baltimore, Boston, Charleston, Chicago, Cincinnati, Cleveland, Columbus, Denver, Detroit, Jacksonville, Los Angeles, Memphis, Minneapolis, Nashville, New York, Orlando, Phoenix, Providence, Richmond, San Diego, San Francisco, St. Louis, and Tampa. It also operates concessions and restaurants at famous tourist attractions including Rockefeller Center, Grand Canyon National Park, Yosemite, and Yellowstone. It should be noted that these are not small-scale, mom-and-pop enterprises that Delaware North runs. For example, the company states that it is a “partner with the National Park Service at the spectacular Grand Canyon National Park,” where it runs the Yavapai Lodge, “the largest lodging complex in the park”, along with the Trailer Village RV Park and host of retail shops that sell food and camping gear. National Geographic reports that 5.9 million people visited Grand Canyon National Park in 2016, making it the second most visited national park. At Yosemite, another top national park, Delaware North recently lost a contract re-bid process to operate various services and subsequently sued the government for use of the name “Yosemite National Park,” which the company had quietly trademarked when it held contracts. Three other categories of Delaware North enterprises across the US worth highlighting are connected to stadiums, airports, and restaurants. Stadiums: Delaware North operates concessions at close to two dozen major sports stadiums in the US. If you’ve attended a Boston Bruins game, you’ve made purchases that the Jacobs family profited off of. There, Delaware North not only has a contract for concessions, they own the TD Garden and the hockey team itself. To be certain, these are huge contracts that Delaware North has with the some of the country’s major stadiums. For example, it operates all food, beverage and retail outlets MetLife Stadium in East Rutherford, N.J., where the NFL’s Giants and Jets play; it is the “exclusive food, beverage and retail services partner of the Texas Rangers at Globe Life Park in Arlington, Texas”; and it the “exclusive food and beverage provider at SunTrust Park,” where the Atlanta Braves play. The monopoly granted by these contracts allows Delaware North to charge eye-popping prices for hot dogs and beer that sports venues are known for. Airports: As with its stadium businesses, Delaware North has major operations in some of the nation’s busiest airports — at least 16 in total. If you’ve flown out of Nashville, New Orleans, Richmond, Detroit, or Austin, there’s a decent chance you bought something to eat from a Jacobs family restaurant. Again, these are no minor enterprises. Of the top 6 busiest airports in the US, Delaware North does business at 4 — Hartsfield-Jackson Atlanta International Airport, Los Angeles International Airport, Dallas Fort Worth International Airport, and Denver International Airport. Delaware North operates multiple eateries at all these airports — and we all know that airport food doesn’t come cheap. Restaurants: Delaware North also operates a host of restaurants across the US in addition to those it runs at airports. These restaurants are typically located near major tourist destinations, such as Disney World or the Rockefeller Center, and they specialize in providing customers with a gaudy but predictable atmosphere and faux-gourmet food. For example, Via Napoli Ristorante e Pizzeria “offers authentic Italian cuisine” that includes “wood-fired pizzas,” while charging higher prices than comparable restaurants such as Olive Garden. To ensure a steady stream of these monopolistic contracts across the US, Delaware North has donated millions to politicians across the US over the course of two decades. According to Follow The Money, Delaware North has given $5,515,175 to 214 different filers stretching across the political spectrum over the past 21 years. 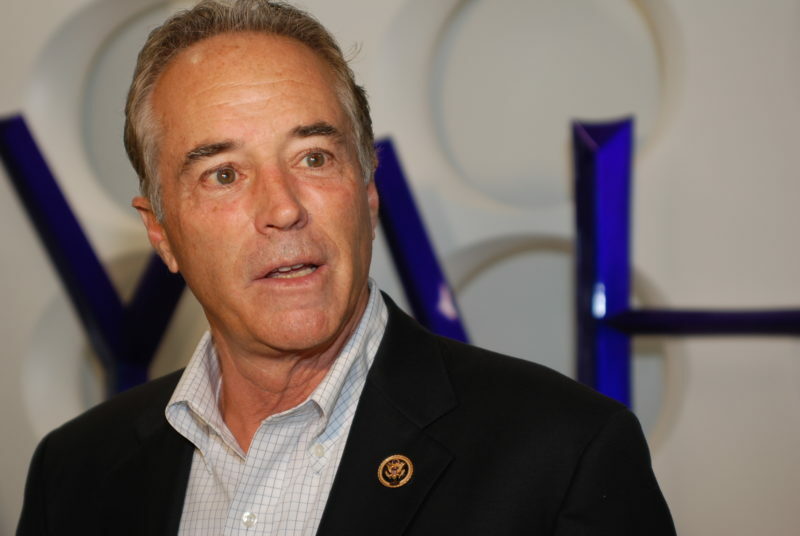 These include donations to the Democratic and/or Republican parties in Florida, New York, Georgia, California, Arkansas, and Maryland. Perhaps not coincidentally, three of the four states where it’s donated the most — Florida, New York, and California — contain the most Delaware North business contracts. A Federal Election Commission search also shows that Jacobs gave — among other donations to many politicians and state parties across the country — at least $6,850 to the Arizona Republican Party, another major site of Delaware North business, as well as at least $4,000 to the Conference of National Park Concessioners Political Action Committee. Buffalo, Minneapolis, Detroit: Is Delaware North in Your City? Delaware North and its pro-Trump ruling family aren’t just involved in controversy in Buffalo. 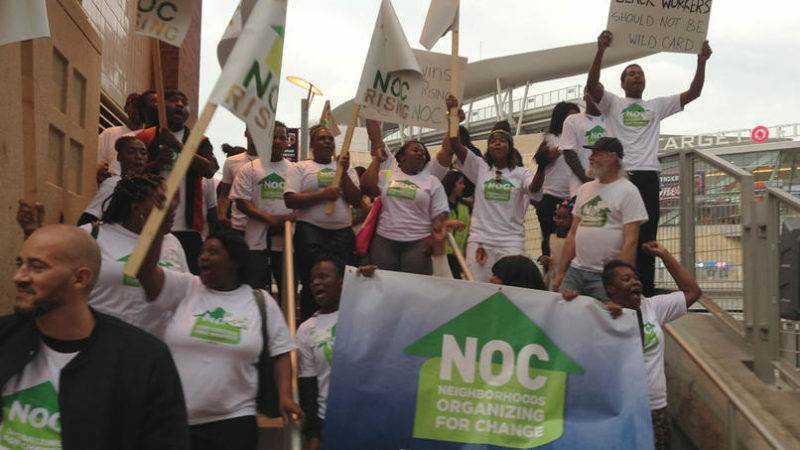 In 2015 Delaware North refused to take responsibility for poor working conditions of temp workers hired to run its concessions stands at Target Field in Minneapolis. Delaware North has an ongoing contract with the Minnesota Twins to provide food and beverage service at the stadium but did not hire a full permanent workforce. Instead Delaware North offered precarious jobs through various temp agencies with hourly wages between $8 and $9.50 an hour, far lower than the price of many of their concessions. Temp workers, the majority of whom were African American, were often forced to wait in long lines unpaid to see if they would have a job that day, which violated a Minnesota law that requires employers to pay for all hours worked, including wait times. Schedules were communicated via text message, often just hours before the start of a shift with no guarantee that workers would actually have a position once they arrived. If a worker did manage to be hired they were paid with debit cards, which were often faulty and carried fees just for checking the balance. As workers began to protest these conditions, Delaware North once again claimed to have no control over how their workforce was treated. Instead they placed blame on the temp agencies they contract with. After meeting with the Minnesota subsidiary of Delaware North, Minnesota Sportservice, workers won back pay for the time spent waiting in the long lines for work assignments and the right to have paper checks and direct deposit options. But Delaware North’s sketchy record doesn’t end there. On August 30, 2017, Delaware North announced that it was partnering with pop musician Kid Rock to operate a new restaurant called “Kid Rock’s Made in Detroit” at the new publicly subsidized Little Caesars Arena. Kid Rock is an unabashed Trump supporter. He recently visited the White House with fellow Trump supporters Sarah Palin and Ted Nugent. Delaware North is the “exclusive food, beverage and retail partner for Little Caesars Arena,” home of the NBA’s Pistons and the NHL’s Red Wings. The Kid Rock restaurant will be part of Delaware North’s food and beverage infrastructure linked to the to the arena. 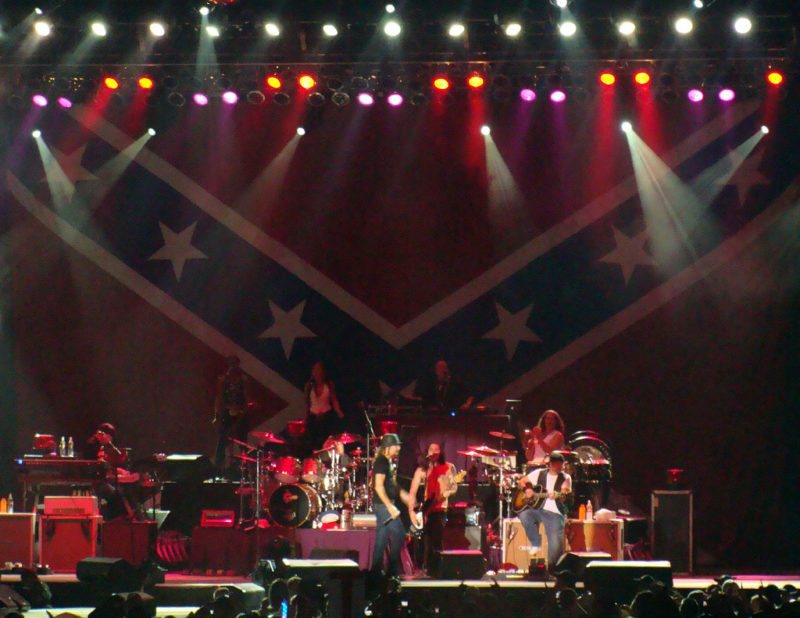 Kid Rock, Jeremy Jacobs’ new business partner, performing in front of a huge Confederate flag. Activists are currently planning protests against a series of Kid Rock concerts that are set to begin at Little Caesars Arena next week. The arena is opening next week, and the first Kid Rock concert will be its opening act. From its association with the ICE deportation machine in Buffalo to profiting off of the name of the Confederate flag-waving Kid Rock in Detroit, Delaware North has dirty hands. To find out whether or not Delaware North is operating in your city, see the database below, or download this spreadsheet.